In this post I am going to give you an overall view of the full IWATA range of airbrushes. Iwata is a Japanese leading manufacturer of high quality airbrushes for both professional and amateurs. Each Iwata airbrush series have a different function, from the budget NEO series to the absolute precision tool that is the Custom Micron (CM) series, through the more versatile Eclipse series. 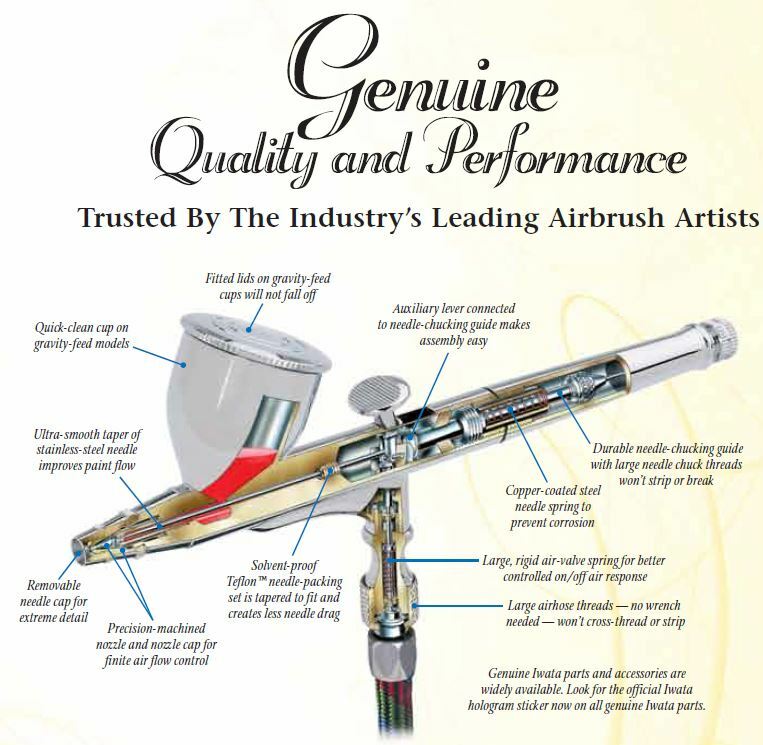 Every Iwata airbrush comes with a 5 Year Limited Warranty. You will definitely find find one model that suits you needs and your budget. Iwata Eclipse Series:Versatility, reliability and performance. Iwata High Performance Plus Series:High-Precision,High-Detail Work. The Iwata Revolution series is very affordable range of Iwata airbrushes with a simple and elegant design perfect for new starter but also more experience airbrush artists. If you are looking for the best airbrush under 100$, carry on reading. models and other general art, hobby and craft projects. Iwata Revolution AR is gravity-feed airbrush designed for quick changes of custom mixed colors. The slotted cavity design makes it easy to clean the airbrush.